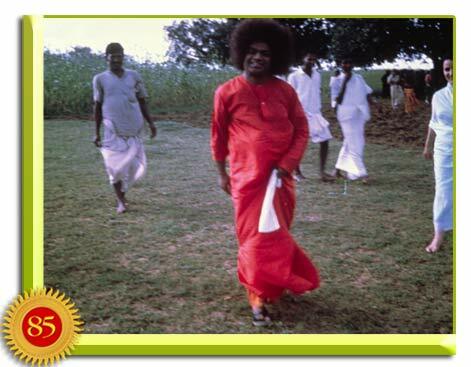 Sathya Sai Baba, after having declared Himself the Avatar, now set about implementing everything on His agenda to bring about the Golden Age. The Dussera celebrations of 1960 presented a platform for the profound declarations that Baba made about Himself and His Mission. He announced that He had come again to proclaim the same principles laid out in the Bhagavad Gita: To give up the fruit of one’s actions and live a life of surrender. “Just as the clouds hide the glory of the Sun, the clouds of doubt and delusion hide My Glory from your understanding,” He said. What Baba wants of all is release from the shackles of “I” and “mine,” just like Arjuna who gave up his ignorance when liberated by Krishna. He informs us that love is the seed, devotion the sprout, faith the manure, good company the rain, surrender the flower, and merging with the lord the fruit. On Maha Shivaratri day, He emphasised the Universal Aspect of His Message and declared that it was for all humanity that He had come. "There is no one in this world who does not belong to Me; all are Mine; they may not call out My name or any Name; still they are Mine." At Coimbatore on 26 February 1961, Baba installed the marble image of the former Avatar Shirdi Sai Baba at the Naga Sai Mandir. This was the first occasion on which Baba was formally installing, for daily worship, an idol of His Previous Manifestation. 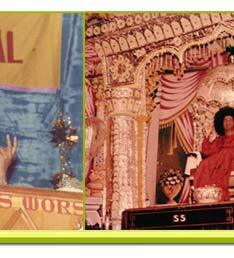 Devotees were thereby expecting some important pronouncement from Baba that day. Baba revealed that the only other instance of an Avatar installing an idol of the Lord is that of Rama installing the Iswaralinga at Rameswaram. That was done as a preliminary to the downfall of the evil Ravana and the demons in accordance with the Divine task of Dushta-nigraha or the destruction of the wicked. 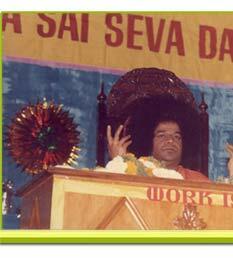 However, Baba said this time around it was Dharma-sthapana or the Establishment of Dharma in the world. Baba has often said that the holiness of a place of pilgrimage is proportionate to the devotion which the aspirants bring with them and the sincerity of the prayers they pour forth before the shrine. Nevertheless, when Baba Himself visits a temple or place of worship, the effect is more profound. It, therefore, made the hearts of devotees in those early days glad to hear that Baba planned a tour to Ayodhya and Benares after a short stay at Madras, now Chennai. The Governor of the North Indian state of Uttar Pradesh took advantage of this trip to the North. Governor B. Ramakrishna Rao called upon Baba to speak to a handful of gatherings in the city of Lucknow. 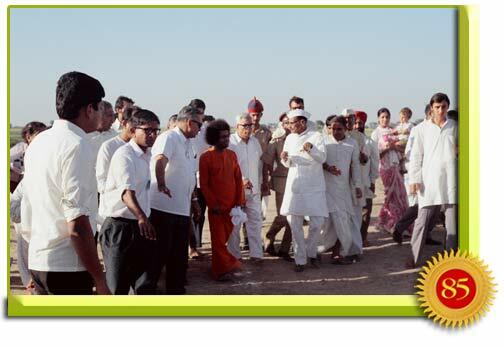 Next, the holy city of Ayodhya was the lucky destination of the Sai Avatar. 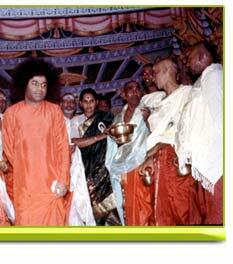 And, Baba brought a group of lucky devotees to accompany Him. There, the Lord’s one-pointed attention showered itself upon the Ramayana’s central sites: The Rama Temple, the temple of Hanuman, and the Sarayu River. Then, the traveling party went to Sarnath and Benares – where Baba visited the Vishwanath Temple. 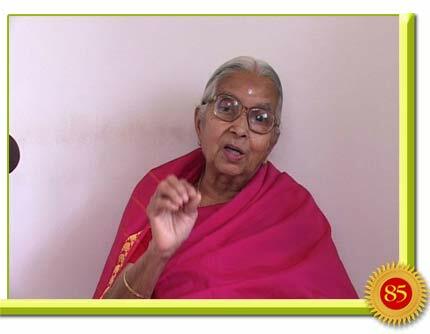 Professor Kasturi tells us about that amazing experience. “The Lingam inside this Temple has been bathed reverentially by millions of pilgrims for thousands of years with the sacred water of the Ganges. 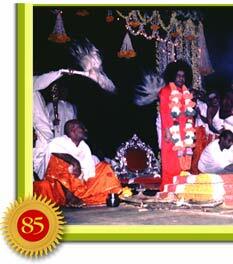 Baba watched the ceremonial pouring of Ganges water on the Lingam, and the recitation of the traditional mantras. Then, as though impelled by a sudden decision, He moved forward and materialising the Kailasa Vibhuti in His palm, He applied it in three broad lines to about three quarters of the rounded image, making it shine with a peculiar splendour. He then created some sandal paste of an otherworldly perfume and consistency, and patting it into a round shape, He approached the Lingam again and applied it to the centre of the triple-lined Vibhuthi. 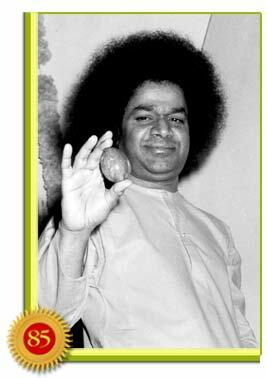 Then, with another wave of the Divine Hand, Baba materialised a priceless jewel of rubies, diamonds, and gold. He placed the jewel on the sandal paste He had already put on the face of the Lingam and asked that arati or worship with camphor flame be performed. Those who observed this ceremony that morning, in the most historic of India’s temples, can never forget it. Subsequently, Baba’s party arrived in Allahabad to witness the holy Triveni Sangam, the confluence of three of India’s holiest rivers: the Ganga, the Yamuna, and the invisible Saraswati that flows underground for most parts of its course. 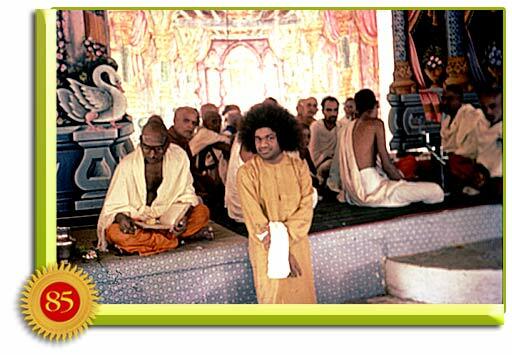 On His way back to Puttaparthi, Baba stopped at Tirupathi, the shrine dedicated to Lord Venkateshwara. There, he spoke of the real meaning of idol worship. He said: “Many people laugh at those who worship idols and condemn it as blind superstition. But, reason is rendered dumb before the testimony of an actual experience. Following a short stay in Puttaparthi and then the Nilgiri mountains, Bhagawan returned north to visit the Himalayan treasures. The sites he visited included Haridwar, Srinagar, Nainital, and Badrinath. 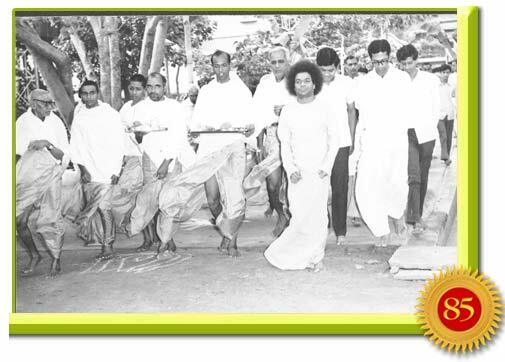 “In Prasanthi Nilayam, under the direct supervision of the Emperor of Puttaparthi, under the direction of the indweller of all manifestations, the ‘Jnana Yajna’ was performed. The pits for the sacrificial fire were arranged on the altar. A large pandal or tent was raised behind the Nilayam. Work was going on briskly. Hundreds of devotees were working round-the-clock. We too joined hands in this task. Mother Sai did not have a moment’s leisure. Vedic scholars, eminent poets, distinguished learned men, veteran chief pundits, constitutional experts, educationists, leading devotees, theists and atheists - all took part in this great sacrifice. 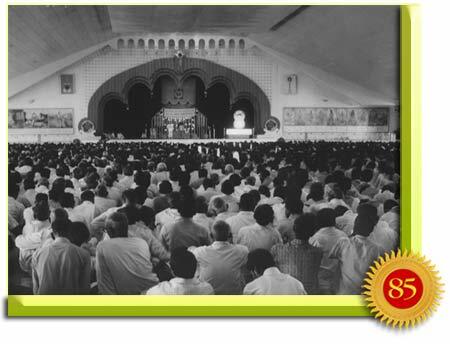 “Festoons of green leaves and flowers, flags of many colors, ornamental designs on the floor, the dais with sacrificial pits decorated with turmeric and vermillion – all these made Prashanti Nilayam shine splendidly, like a new bride. Everyone was running around like a sucking calf. 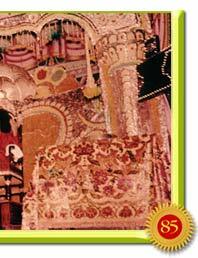 Every tree, mound, and hillock became a camping site for the devotees. “On the last day of this week-long yajna, Baba arrives as the Vedapurusa, materialises and offers nine types of grains, ghee and navaratnas to the sacrificial fire for the welfare of the world. 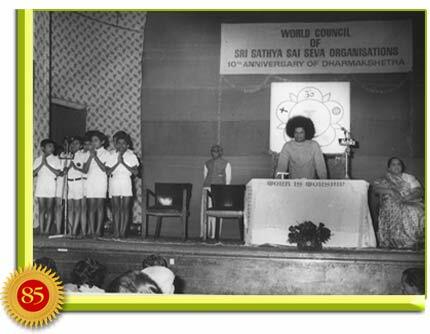 The year 1961 was also important for the Sri Sathya Sai Service Organisations. 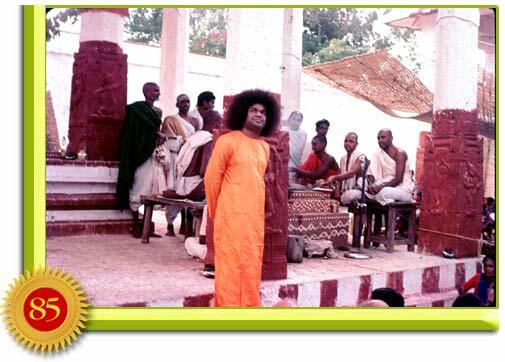 The Samithi, thenannounced by Baba, has today developed into a worldwide organization encompassing more than 125 countries. “Passing through childhood and the stage of fun, frolic and diversion, our dear Sai entered the stage of upadesa or instruction. To speak the truth, this lay buried in Himfrom the beginning. But He had been waiting for the right time, for the maturing of mankind. Do we look for a harvest after sowing seeds in a saline soil? Earlier, He had sowed only a few seeds. Can Man Fathom God’s Ways? 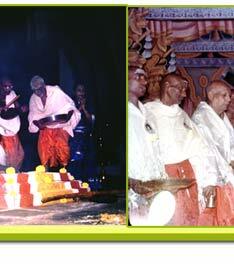 Finally, on 21 October, He announced that the Mission of the Revival of Dharma for which He had come has begun. "Until now, it was in the preparatory stage; from now on, the work will proceed without slackening speed. It is now for you to share in this campaign for the liberation of man from ignorance. In no previous era have men got so many and so clear intimations of the Advent of the Avatar, as now." 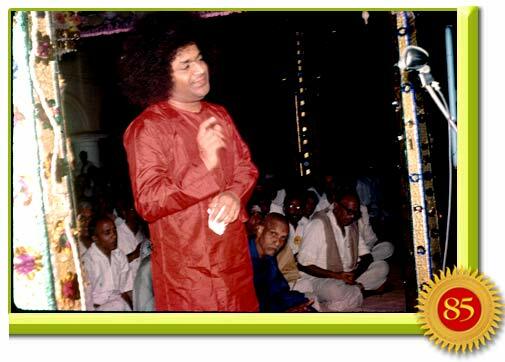 On the holy day of Shivaratri in 1962, which fell on 4 March, Baba advised the thousands who had witnessed the emergence of two golden Lingas from Him, "Why do you discuss and debate among yourselves about My nature, My Mystery, My miracle, My reality? Fish cannot gauge the sky; the gross can grasp only the gross. "The eye cannot see the ear, though it is so near. When you cannot reach down to your own reality, why waste time trying to explore the essence of God? You are like a Telugu audience sitting through a Tamil picture, or a Malayali sitting through a Japanese film. The nuances, the subtler significances, the deeper meanings and interrelationships, the inner patterns of the fabric, are beyond your understanding. Sit through the entire film; master the language and the technique; watch earnestly and vigilantly and try to imbibe the meaning of every gesture, act and word; then, you may know Me, a little." The re-establishment of dharma or righteousness had begun! In our next installment we will learn the holy details of how Baba recharged the spiritual potency of the holy temple of Badrinath.